Elephants often walk through camp! Kakuli Camp in South Luangwa National Park, Zambia, is a seasonal camp on the confluence of the Luwi and Luangwa rivers. There are four spacious tents under shady thatched roofs, each with an open-air bathroom. All of the tents overlook the river with stunning views up and down this hippo-packed stretch of river. There is a lovely chitenge (lounge with a deck) overlooking the grazing lawn that leads down to the river. This area of the park is renowned for its great gameviewing and guests will usually split their time between walking and driving (and boating in the green season). Guided walking safaris were poineered in the Luangwa Valley and remain arguably the best way to view the wildlife, allowing guests an insight not only into the game but also into the whole natural envrironment. Game drives are offered just after sunrise and at sunset and use open vehicles to enable excellent viewing opportunities. Open: Kakuli Camp is open from January to November each year. It is owned and run by Norman Carr Safaris (NCS). Location: The camp is in South Luangwa National Park, situated on the banks of the Luangwa River, just a few hundred yards from the confluence of this and the Luwi River. It is about a 2 hour game-viewing drive from Mfuwe airport. Rooms: There are 4 walk-in safari tents, all with en-suite facilities consisting of a shower with hot and cold running water, hand basin and separate flush toilet. Toiletries are provided. The tent at the front of the bedroom can be fully opened up to reveal views of the river. There's a small deck and chairs to the front of each tent. Activities: The main activity is walking, complimented by game drives by day and night, with guests being able to choose their preferred activity each day. In the green season (also known as the emerald season), between January to March, boating safaris are also available. Kakuli Camp can be combined with other NCS camps and Kapani Lodge for a varied holiday in South Laungwa. Facilities: Thereâ€™s a chitenje made of reed and thatch which houses the lounge and bar, the social heart of the camp with ample seating, which faces the lawn that leads down to the river. Thereâ€™s a separate covered dining area, and a deck built out over the river where a fire is lit each evening. Dining: Meals are eaten as a group, with breakfast served by the campfire, lunch in the thatched dining area, and inner usually out in the open. Afternoon tea is taken in the chitenje. Children: Children aged 12 years and over are welcome, though there are no special activities for children. The camp is unfenced so children need to be kept under supervision at all times. Communication: There is no Wi-Fi internet access or mobile coverage. Kakuli Camp is in radio contact with the other NCS camps and the main lodge, Kapani. 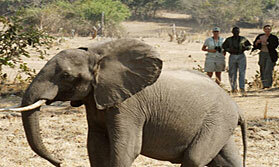 Get a great deal for high quality camps in South Luangwa in peak season. "This was our favourite camp with everything you need for a special safari. Did not like the deck chairs on the cabin verandah, would prefer wicker arm chairs."